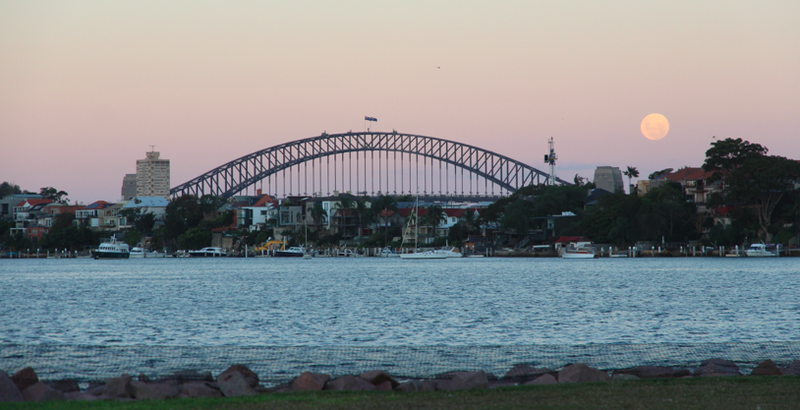 Sydney Harbour and that famous coathanger from a few angles | Where to next? 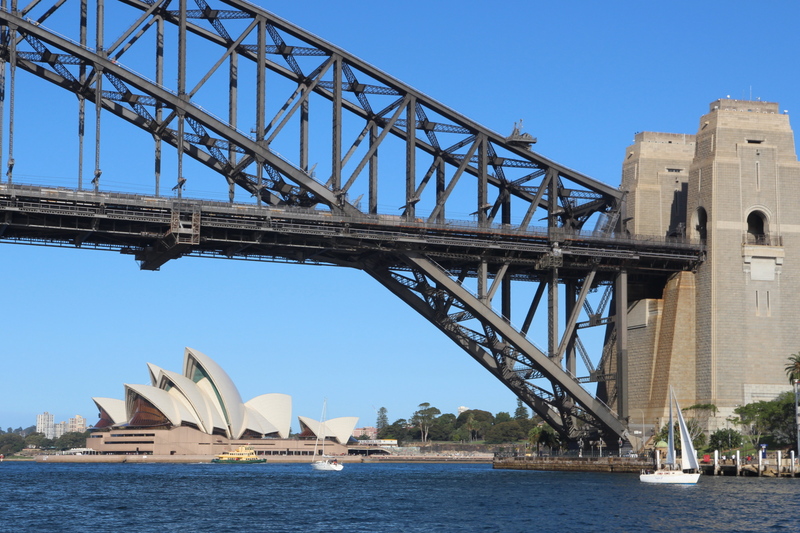 Sydney Harbour is a unit of measure—rather like Belgium and Olympic swimming pools—as in how many Sydney Harbours does it take to fill up a whatever you pick? But once you get past that thinking, the harbour is a fabulous body of water and a magnificent landscape that changes with the weather and the time of day. 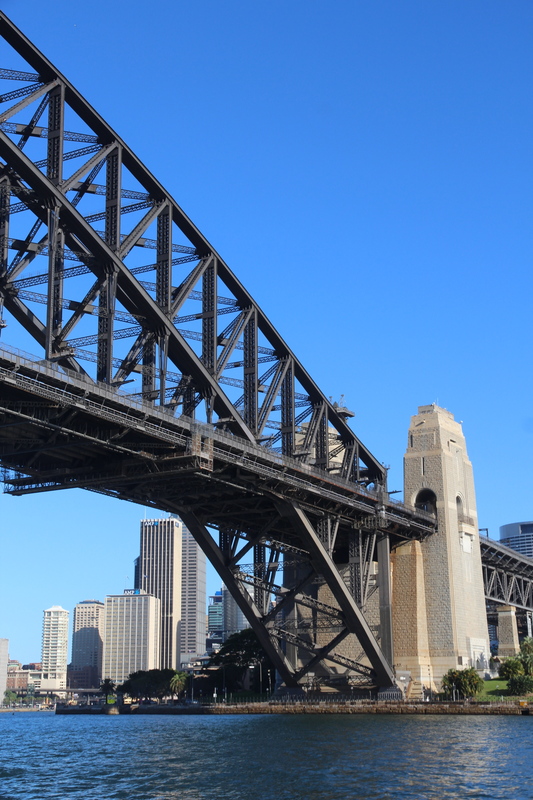 And the Sydney Harbour Bridge, fondly known as the coathanger for its arched shape, is an important focal point for the busy harbour. It’s the largest (but not longest) steel-arch bridge in the world. Lots of New Year fireworks get set off there (I must record that one day) and the bridge climb is a popular activity for Australians and foreigners alike. I keep meaning to buy Poor John a bridge climb (they aren’t cheap) for a birthday or Christmas present (shh, don’t tell him), but I never know exactly when we’ll be around. Note to self: plan ahead. Anyway, last week Poor John and I were on a ferry on the harbour, travelling to Cockatoo Island to see one venue of the Biennale of Sydney’s contemporary art exhibition. Usually we head east on the harbour, but Cockatoo Island is west, near the junction of the Parramatta and Lane Cove rivers. So we went west and under the bridge. It’s the first time we’ve gone that way in a very long time. 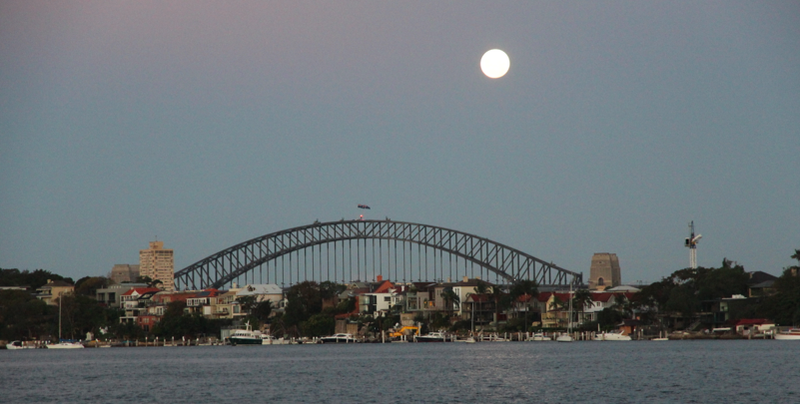 I thought you might enjoy seeing some of the images I captured, including two shots of moonrise taken from the wharf at Cockatoo Island. If you’re ever in Sydney, take yourself out to the island. It’s a great place to explore—you can even stay the night and go glamping (glamour camping). A bridge walk sounds fantastic, though I wonder if I could keep my stomach in place for the taller portions! I can’t imagine how beautiful the view from the top must be! Guess I’ll have to get Poor John and me up there soon so I can take some pics. Sorry we missed the moonrise. That’s a breathtaking photo. Guess that means you’ll have to come back. Hi Peggy, you can take all the awsome views and pictures with your eyes only. You aren’t allowed to carry anything, everything needs to be harnessed and so is everyone. They don’t want anything dropped off or landed on top of car roofs and people. It’s amazingly safe and not as churning as thought. Night climb costs a bit more. Christmas present for you & John sounds great. I loved it. I love these pictures of the bridges, I enjoy looking at bridges, something about them fascinates me. I like bridges too. It’s interesting that in some third-world countries it is forbidden to take photos of bridges. Seems a silly rule. I wouldn’t have known that, and I wonder why that is. The only reason I can come up with is maybe it is dangerous to be near a bridge in most circumstances to take a picture, other than that, I wouldn’t understand the point. I think it’s a hangover from the days when countries were suspicious of anyone taking pictures of bridges, military installations, ports, official residences and other government property. We rode a truck through Africa for almost a year and at the outset were warned never to photograph bridges, ports and police stations. I once photographed a police station by mistake (who would expect a police station in the middle of a farmers’ market?) and the police stopped the truck, made me show the photo and made me delete it from my camera. More biennale and the Art Gallery of NSW | Where to next?